14ymedio, Marcelo Hernández, Havana, 29 January 2019 — After the devastation left by the tornado that hit several Havana municipalities on Sunday night, many of the affected families have nothing to eat and nowhere to cook their food. Without electricity, storing any food is an illusion and some have lost every last penny in cash, crushed, under the ruins of their homes. In the midst of this scenario it was assumed, and it should be expected, that the State would immediately create the conditions to deliver cooked food to these people free of charge. Instead, the official stores arranged a special sale of eggs and cookies in State markets. The “special” does not refer to discounted prices, but to the very fact of selling products that have virtually disappeared from the stores. 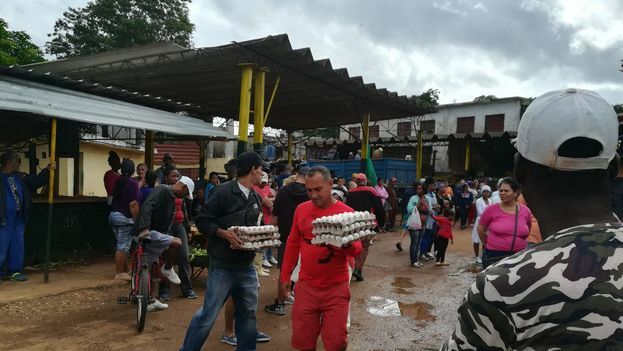 Some people, who in the town of Regla stood in a long line to buy eggs, commented that they were seeing people there who were not from the neighborhood. “Surely they were told to resell them in Havana,” suspected a distressed resident who lost the roof of his home. “It would be the last straw,” replied a man who appeared to be a retiree. Beyond suspicions of those who might have come from unaffected neighborhoods to buy a products missing from the shops for weeks, what most bothered Regla residents was the sale of food, not its free distribution. Those who still had some money ate that night, the others either appealed to a friend or slept with an empty belly.